I cannot roast a chicken for the life of me. It is super true! I have tried it numerous times over the years with no success. It always ends up way too dry. I have a fear of it being under cooked, so I tend to roast it way longer than needed. A while back I got food poisoning from uncooked chicken. It was the worst experience! It was so painful that I could not move. If I made just a slight move, I would get the worst stomach pains. I spent the entire day motionless in the fetal position. I do not wish that pain even on my worst enemies, if I had any. So now you understand. I have tried several recipes, with no success… even a Martha Stewart recipe! I have been successful with roasting chicken pieces, mostly chicken thighs. I guess that you cannot really overcook chicken thighs since they tend to be more fatty. As I was walking thorough the grocery store a few weeks ago, I was eyeing this whole chicken. “It would be so nice to roast an entire chicken in order to have leftovers for the week.”, I thought. I also thought about just buying a premade rotisserie chicken but I decided that roasting my own would be so much better. So I took it. Since I have no clue about how to break down a chicken and do not really care to attempt it, I asked the butcher at the grocery store to cut it down for me. As soon as I got home, I contacted my brother (who is a chef). “I have this entire chicken. How long will it take? An hour at 425 degrees?”, I asked. His answer changed my life… ok, maybe not my life, but definitely shed all my fears about roasting a chicken. :) It really did! First, do not roast a chicken whole. Roasting a broken down chicken allows each piece to cook independently, especially the breasts, which take the longest. Also, never add lemon juice or any acid during the cooking process. Second, submerge your chicken pieces in a brine. I have been using about 6 cups of water and 1/2 cup of salt. You can certainly use more or less depending on the size of the chicken. I let it sit in the brine for no less than 15 minutes. If you let it sit longer, go easy on the seasoning during roasting. Third, after adding some olive oil and some salt and pepper, roast the chicken in a preheated 425 degree oven until the pieces reach about 150 to 155 degrees. For me, that is anywhere between 20 to 25 minutes. The thighs reach the temperature faster than the breasts. I have to let the breasts roast about 5 minutes or so longer than the rest of the pieces. If your oven runs hotter, check it earlier. The trick is to reach that temperature, so check often if needed. Fourth, once the pieces reach the 150 to 155 degrees, remove them from the oven and let them sit for 10 minutes. Do not be tempted to do anything with them at this point. Just let them sit. Fifth, once the 10 minutes are up, put the chicken back into the oven and continue roasting it until it reaches the recommended 165 degrees. For me this is anywhere between 10 to 15 minutes. Again, the trick is to reach the 165 degree temperature, so check often if needed. Sixth, once roasted, remove the chicken from your pan and squeeze some lemon juice over it. This will give the chicken that great lemony flavor, which I love. Next time you are craving roasted chicken, give this a try… you will not be disappointed. It has been a while since I have written. I have been cooking a bunch, but I just have not had the time to write about it. Julia still has only 2 teeth so I still have to be conscious of it when cooking. Hence the roasting galore! I have been on a roasting kick lately. I have roasted all sorts of veggies, mostly the ones that are in season… eggplant, zucchini, yellow squash, tomatoes, broccoli, cauliflower, peppers, sweet potatoes. Recently I have added squashes to the mix, mainly spaghetti squash, acorn squash, and butternut squash. 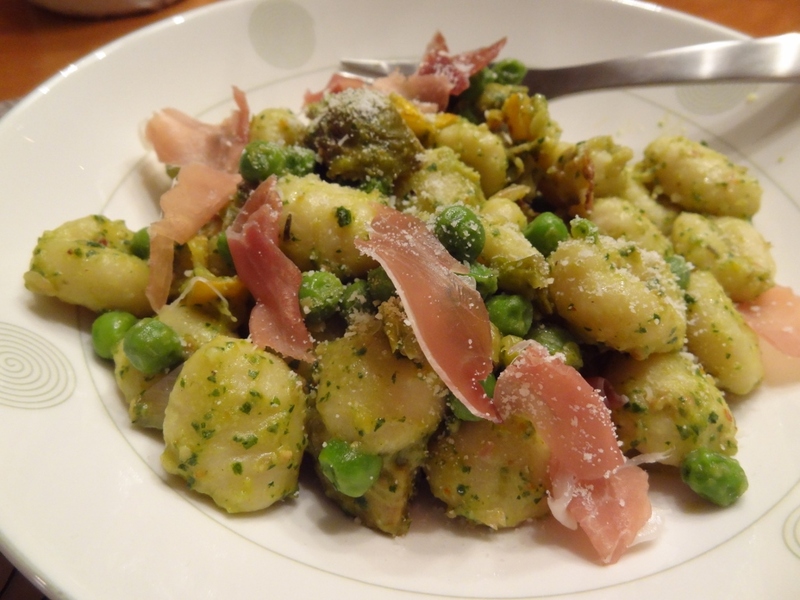 Gnocchi with pesto, roasted veggies, and prosciutto. My sister-in-law, Jeni, pinned a recipe on Pinterest that I was very excited about. It was for a Red Quinoa with Butternut Squash, Cranberries, and Pecans. Yum… right?? How can you go wrong with roasting butternut squash along with some curry and maple syrup. Heaven!! I have made it several times already. 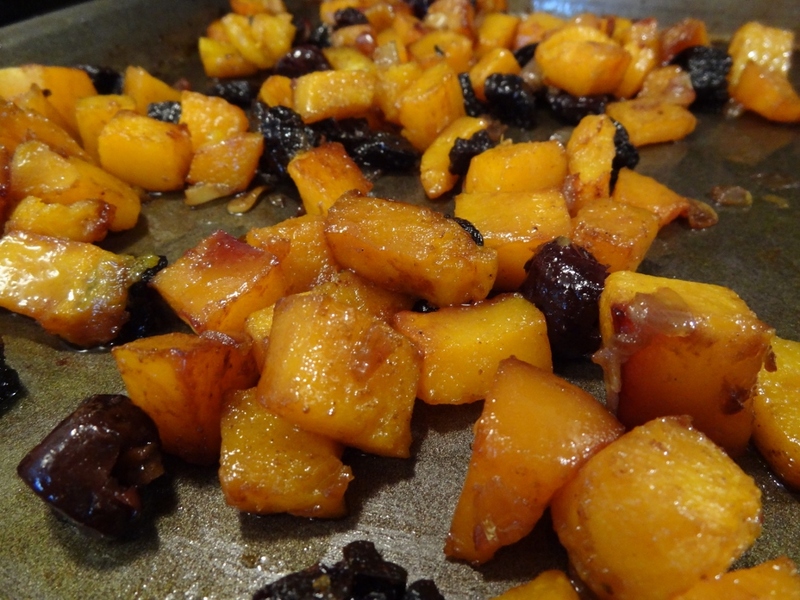 The recipe is super simple… you simply add the butternut squash, cranberries, onion, and garlic to a roasting pan and then drizzle some olive oil and maple syrup and then sprinkle some salt, ginger, and curry on top. You then mix it a bit to coat the squash with all the goodness that you just added and then roast it for about 20 minutes or until the squash is soft. The first time I made it, I did not have fresh cranberries or onions in the house, so I used shallots, which I love roasting, and I added some currants once the dish was assembled. It was really nice. 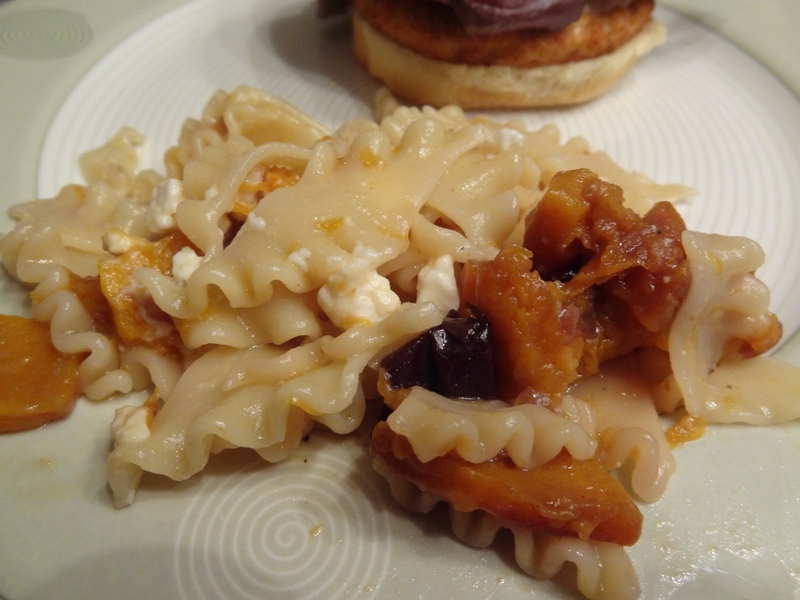 My friend Kristin and I were talking about the dish and she reminded me about a similar recipe that she made, where she added dried cherries. I immediately thought about using fresh cherries. Wegmans sells frozen cherries, which I love, so I decided to give it a try. The combination of the roasted squash and roasted cherries is amazing! I will not go back to using any other dried or fresh fruit. I highly recommend it! The best part about this dish is that you can just eat the squash by itself or add it to a bed of greens, or to some quinoa, or to any other grain or pasta. It’s definitely a keeper! I have been going to the market every Saturday morning. I love taking Julia with me and scoping out veggies and fruits together. Although, I think that I have more fun than she does. :) She does like to pick out the fruits… raspberries and blueberries to be exact. They are her favorites. As you may already know, it is eggplant, zucchini, and yellow squash season. Since I love to buy things that are in season, I have been buying them every week. I love roasting them with some shallots, olive oil, and whatever herb or other veggie that I have in the fridge. Julia loves them also. The first time I made them, she inhaled them. She does not seem to mind eating them regularly either. I have been serving them over salad, in pasta, or just as a side dish. I have kind of gotten bored of just eating them as is, so I decided to seek a new dish. My sister mentioned this dish that included eggplant and mango… the recipe is called “Soba Noodles with Eggplant and Mango” and can be found in the cookbook called Plenty: Vibrant Recipes from London’s Ottolenghi by Yotam Ottolenghi. My sister also informed me that Heidi Swanson of 101cookbooks included a rendition of the recipe in her blog. After reading the recipe, I was sold. It sounded really delicious and thought that Julia could probably eat it as well, the veggies at least. I read both versions of the recipe and I decided to follow Heidi Swanson’s version… I really do not have any specific reason of why I did that. They are very similar, so I am sure that either version would yield super results. The recipe was indeed delicious! And Julia loved it too! She loved the veggies, of course. She also liked the noodles. She did not eat too many noodles, but she liked them. I was unsure if she would really eat it after reading the recipe more closely since it required garlic and crushed red pepper. It was definitely a little spicy. But she did not seem to mind it. I am so proud of her!! She never ceases to amaze me… she loves everything that I cook for her. I am so lucky! I do want to mention that I did make a few adjustments to the recipe. I decided that instead of pan frying the eggplant, I would just roast it, since it is easier, for me at least. I also added some zucchini and yellow squash, which I also roasted along with the eggplant. I did not use tofu or red onion. Since I roasted the veggies with some shallots, I decided that it was enough onion. Plus I really dislike raw onion. The mango that I used was super ripe, which I think that added some liquid to the dish. I kind of liked it that way. The recipe requires removing as much liquid as possible when draining the noodles. I did not mind it a little liquidy… I do not like dry pasta. I also only used 1 garlic clove, since I do not like a lot of garlic and thought that Julia might not like it either. One thing that I did not like about the dish is the difficulty of incorporating all of the ingredients. I found it hard to mix everything together. I find it to be the same with any stringy noodle though, so I should not have been too surprised. Ha!